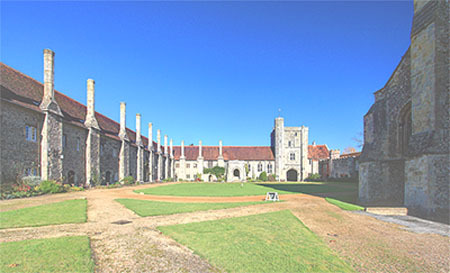 Hospital of St Cross. Enchanting gardens, a pretty river, green meadows, an interesting place – everything for a pleasant day out. 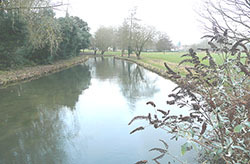 One of the nicest ways to get to The Hospital of St Cross from Winchester itself is along the footpath by the river, that starts near Winchester College. Takes about twenty minutes, unless you want to amble – and why not, we hurry too often! If you are travelling by car go along Southgate St, off the High Street. This street eventually becomes St Cross Road. Keep a look out for the BP garage then turn left into St Cross. If you get as far as the Bell pub then you have gone too far! Parking is available at St Cross. Do not have a car, do not wish to walk? There are several buses that go in that direction. Hospital – not in its modern usage, but in its original usage as a place that gave hospitality. Originally the hospitality was for the pilgrims to Canterbury a Wayfarer's Dole of ale and bread was always handed out and still is. It has been called ”England's oldest and most perfect almshouse” and that may well be right for it is beautiful. It is certainly the oldest almshouse continuing in use in England. Legend has it that it was built on the site of a religious house that was in ruins, nothing remains of that. The almshouse was actually set up to support 13 frail men who could not support themselves, the Brothers of St Cross, and to feed another hundred people each day. A Norman Church and medieval buildings make up this Grade 1 listed complex that today looks as though it was never built but was always there, as though it grew. The Hospital of St Cross was founded in the first half of the 1300's by Henry Blois, a young and powerful man then, Bishop and the first Henry of Winchester, grandson of William the Conqueror. A man of vision he has certainly left a beautiful legacy. Cardinal Henry Beaufort, a later Bishop of Winchester and also a very powerful man, did a lot more work in the fifteenth century and the result is what is there today - a delightful place. Or you may wish to browse some more. Please do, there are navigation buttons above on the left. 1st April to 31st October. 10.30am to 3.30pm but closed on Sundays with the exception of the Sunday services. A cuppa - thank goodness!